- Independent feeding can start at around 12 months. You can start to introduce your baby to the ... family meals chopped into manageable pieces. - Complies with EN 14372. Includes knife, fork and spoon. Lightweight and easy to hold. Chunky, soft grip handles, ideal for toddlers. Encourage their first steps in grown-up eating. Suitable for 12 months upwards. 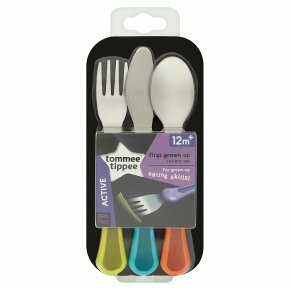 All Tommee Tippee cutlery is BPA free. Encourage your little ones to take their first steps in grown-up eating with this knife, fork and spoon set specially designed for little hands. Lightweight, with easy-grip handles that are easy for little ones to hold, your toddler will really start to feel grown-up at family mealtimes. Rounded ends make this first metal cutlery set suitable for little mouths. Cleaning Before first use, clean the product. Clean before each use. Always wash the product immediately after use. Wash in warm soapy water and rinse in clean water or use a dishwasher (top shelf only). Do not clean with solvents or harsh chemicals. Staining may occur if the product is allowed to come into contact with oil-based foods (e.g. oil/tomato based sauces). Not suitable for microwave use. Please read and retain this important information for future reference. For your child's safety and health<br>Warning!<br>Always use this product with adult supervision. Accidents have occurred when babies have been left alone with feeding equipment due to the baby falling or if the product has disassembled. Before each use, inspect the product. Throw away at the first sign of damage or weakness. Always check food temperature before feeding. Heating in a microwave oven may produce localised high temperatures. Take extra care when microwave heating. Always stir heated food to ensure even heat distribution and test the temperature before serving.<br><br>Keep all components not in use out of reach of children.